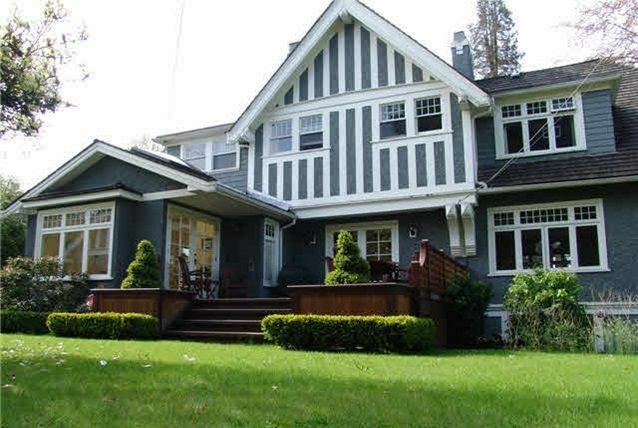 HUGE LOT IN PRESTIGIOUS SOUTH GRANVILLE LOCATE 75x147.60 (11,143.80 sq. ft.). Updated 4,331sq.ft. Tudor-style home sits on beautiful Landscaped level lot with South facing. Steps away To MAGEE HIGH SCHOOL, MAPLE GROVE ELEMENTARY. Close to YORK HOUSE, CROFTON and ST. GEORGE'S PRIVATE SCHOOL, UBC, TRANSIT. 4 bedrooms up INCLUDE large master bedroom with Fireplace. Inlaid oak hardwood floor throughout with intricate plaster detailing, newly refinished wood floor upstairs, updated bathrooms and kitchen, and fresh paint. Sunny skylight Eating area, open via French doors to large sundeck and PARK-LIKE GARDEN. EXCELLENT HOLDING PROPERTY for INVESTOR or BUILDER. MUST SEE!